CRUNCH! Iron Man 3 starts filming in Wilmington shortly, under the working title Caged Heat. If you want to be part of the rumoured nanobot-based blockbuster, Caged Heat is calling for extras on its Facebook page, right after the jump. CRUNCH! While Disney named April 4, 2014 as the sequel date for Captain America The First Avenger, Fox and Lionsgate Studios crafted a schedule for hit actress Jennifer Lawrence to allow her to still star in both of their top franchises. Her first reprise; Katniss in Lionsgate's The Hunger Games sequel, Catching Fire, filming this fall, followed by her reprise of Mystique in the sequel to Fox's X-Men: First Class, which starts filming in January. CRUNCH! 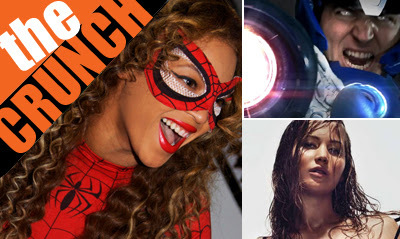 Centred celebrity Beyonce has let the world inside her personal life, with a series of fun-filled photos on her tumblr. Floating near the top of the stack, the octave smashing super-star dressed as Spider-Man - proving if you liked it, then you shoulda put a web on it! See her other global snaps and good times right after the jump.